the sky was painted blue by the reflection of sapphires. the blue color of the sapphire represents the heavens. Translations in several languages reveal sapphires to be dear to Saturn. Ancient lore held that the tablets upon which the Ten Commandments were written were actually sapphire. Kings used to wear sapphires around their necks as a powerful defense from harm. They were said to attract divine favor. In the 12th Century, the sapphire was known as the most appropriate stone for ecclesiastical rings. 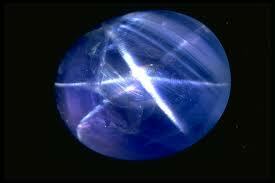 The Sinhalese believed that the star sapphire served as protection and a guard against witchcraft.